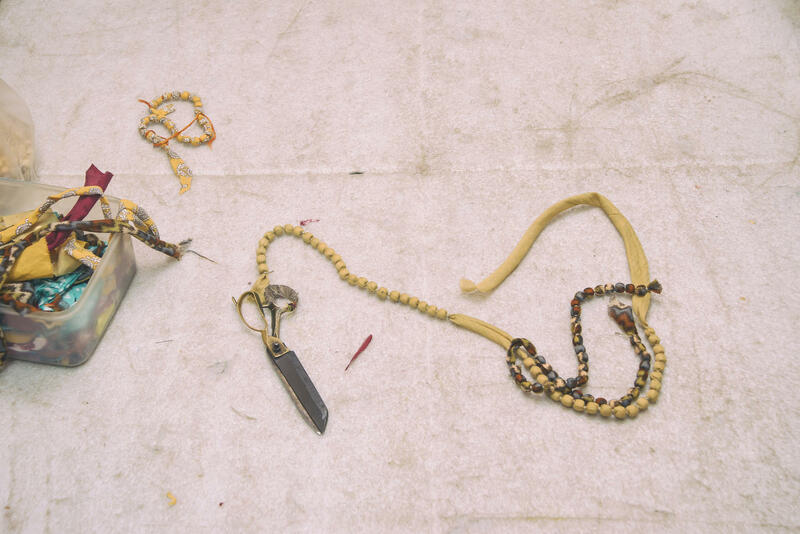 Serendipity Arts Trust (New Delhi) commissioned five women photographers for the 3rd project in the UNSUNG series by Mahesh Bhat to depict the stories of the unseen lives, places and philosophies deriving inspiration from the writings of botanist Robin Wall Kimmerer’s book on mosses. 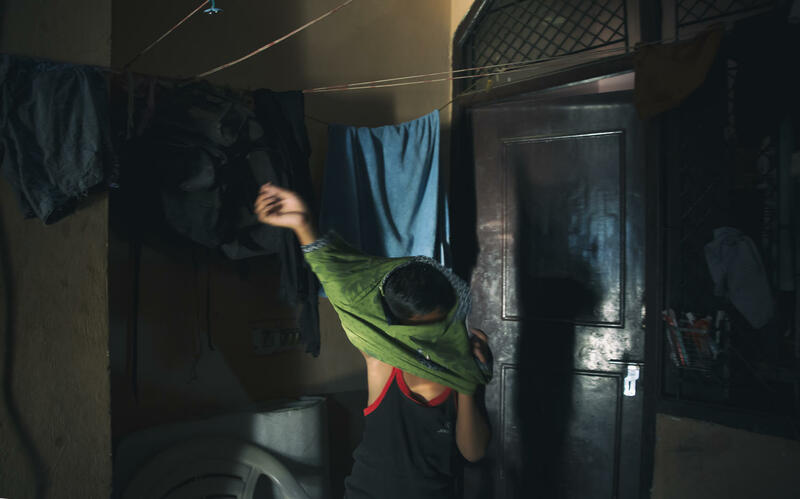 The resulting multi (mixed) media exhibition, ‘Celebrating the Extraordinary Grandeur of Smallness’ was curated by Mahesh Bhat and Dinesh Khanna and produced by the work of five women photographers/lens-based artists – Aparna Mohindra, Deepti Asthana, Karen Dias, Neeraja Rao and Sharmistha Dutta. Exhibited as part of the Serendipity Arts Festival, 2017 in Goa, India. Living in Gurgaon (or ‘Gurugram’) one is used to the crowds, the stares, the rush, the traffic (both human and vehicular), but as one walks through Wazirabad- past the market and the constant traffic jams- the lanes start to get narrower, the crowds slowly disappear, and time isn’t your enemy anymore. 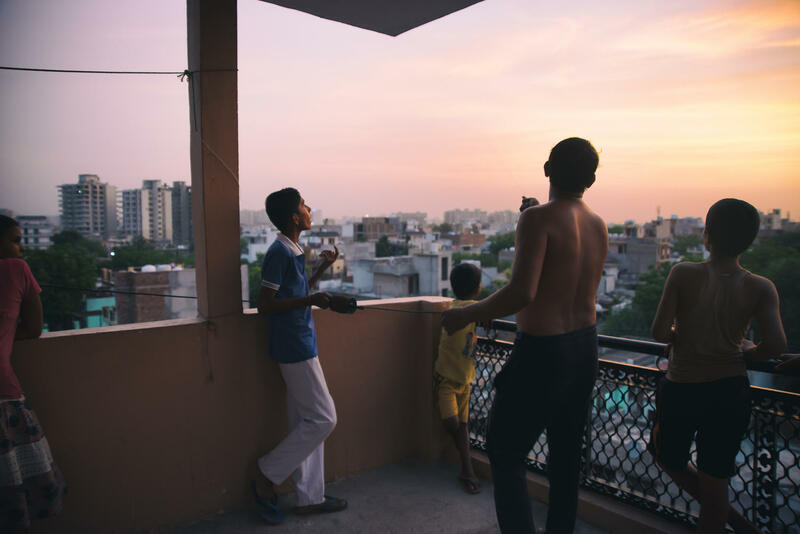 Amidst this quiet and chaos of Wazirabad, I found Sangeeta and Bimlesh, residing in a building extraordinary in itself- accommodating nineteen families renting out a room each, with a common washroom on each floor and a common terrace for the entire building. With almost every family coming from a different state- the building is like a country in itself, or like a jigsaw puzzle- everyone with their own quirks fitting to make a huge family, close enough to trust every room’s door to be left open. 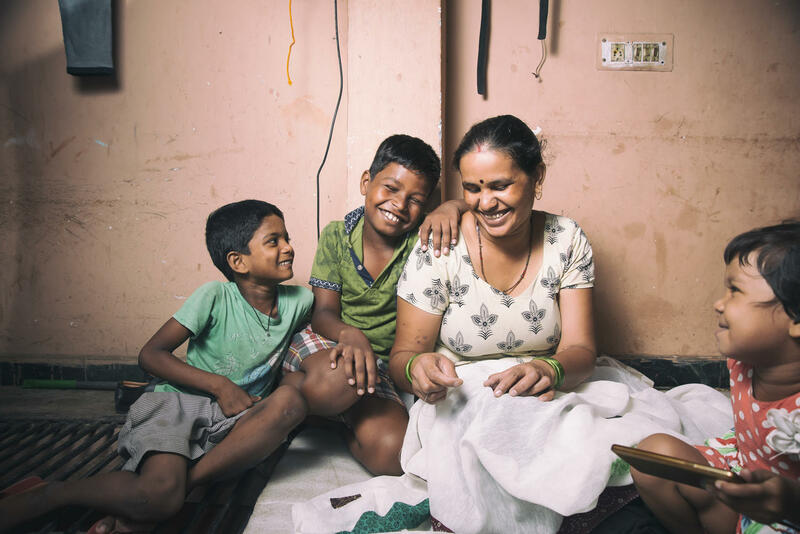 What brought me to both these women was an organization named ‘Nrinam’ run by Aishwarya Tandon with the goal to provide vocational skills, such as sewing, stitching, and embroidery, in order to ensure the financial independence of a number of girls and women around Gurgaon. Meeting Sangeeta and Bimlesh, I was thrown by how genuinely happy they are, and how unfamiliar it felt to see and experience such happiness. 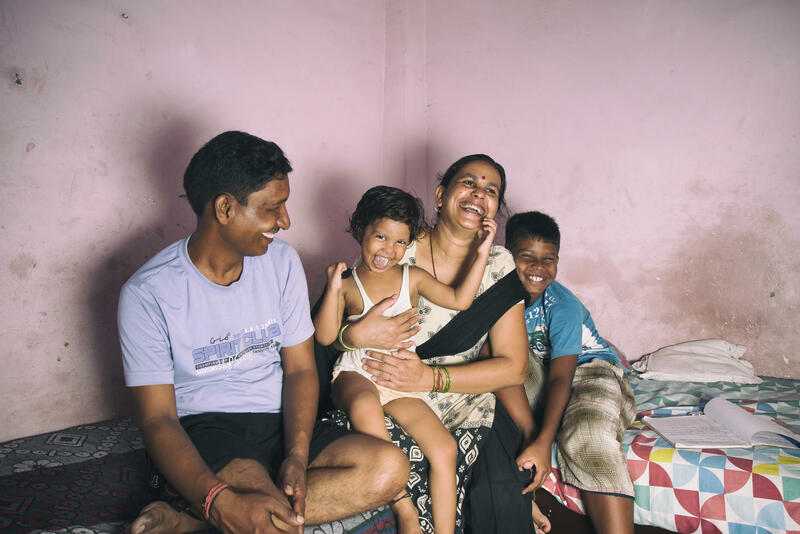 Meeting them, I realised that sometimes happiness could be fine enough to pass through the needle hole unnoticed, but sews itself over and over into the lives of Sangeeta and Bimlesh. 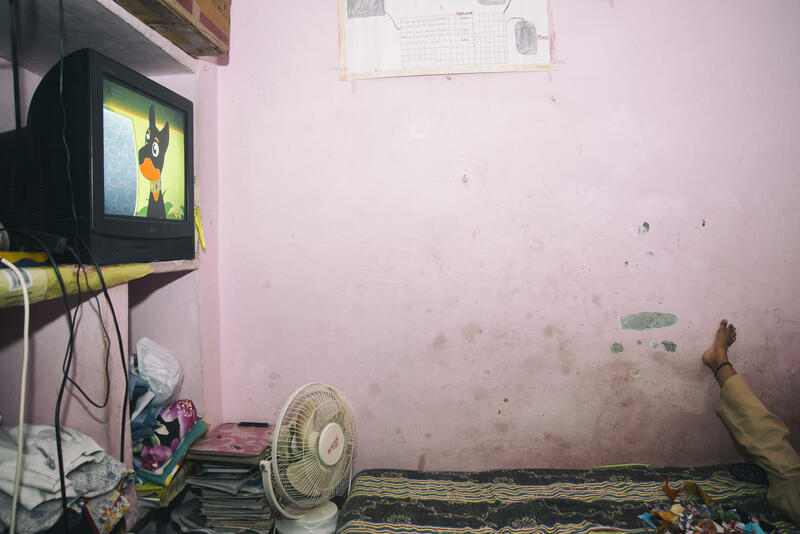 Four-member families living in one little room- a television, refrigerator, bed, all serendipitously fit into a limited space that alternates between being a work space, a resting space, a living space, a dining space, and more, yet causing no conflict between it’s inhabitants or their space(s). 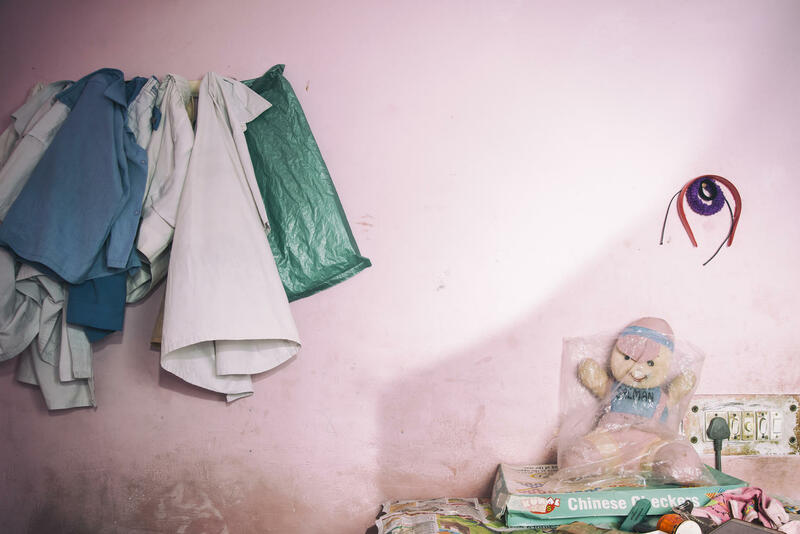 Photographing their everyday life, from working in the kitchen to taking care of their children, to making a life within the four walls of their home which never seems to restrict them- their lives celebrate the fact that grandeur is often in the small elusive details. 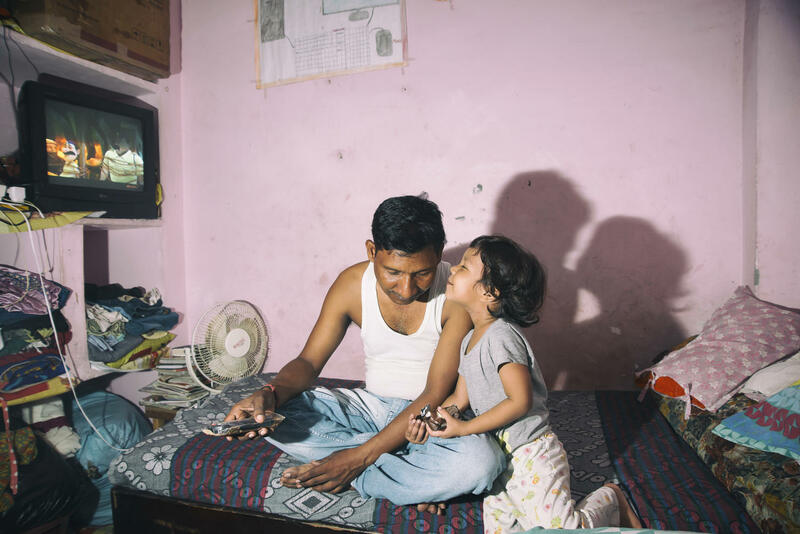 Both Sangeeta and Bimlesh’s husbands wholeheartedly support their endeavors- which serves as a reminder that the simplest joys in life come with a gentle push and the quietest supports. The grandeur sometimes lies in the most elusive things in our day to day lives- it dissolves in the silent victories, risen hopes, and laughter of children on the streets of Wazirabad, who celebrate the extraordinary grandeur of smallness in ordinary ways.